After pulling out of the Iran nuclear deal last year, the United States implemented renewed sanctions on Iran in an effort to change their malignant behavior ranging from missile tests to terrorism. While European nations have reportedly been looking at ways to evade the sanctions to try and keep Iran in the endangered nuclear arrangement, one central European country hasn’t been so eager to buck the American pressure on Iran and Israel wants to keep it that way. Austria refused to host discussions on the economic creativity seeking to get around Iran sanctions—known as a Special Purpose Vehicle (SPV)—and Israeli Prime Minister Benjamin Netanyahu commended their European ally for taking that position in comments with visiting Austrian President Alexander Van der Bellen on Tuesday. 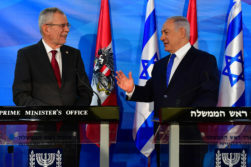 Netanyahu’s comments with the Austrian official come a week after Austrian Foreign Minister Karin Kneissl discussed European-Iranian trade with an Iranian diplomat in Vienna, according to the Mehr News Agency. Trump also pointed to his decision to withdraw from the Iran nuclear accord last year as an achievement for 2018. While key partners in Europe don’t view Trump’s actions against Iran as a positive, Austria, at least so far, hasn’t made the sanctions-busting as easy as possible. Israel hopes that continues.